Download the Teacher's Guide to bring the power of this award-winning film into your classroom. The Guide is keyed to chapters on the DVD that will help you to explore specific topics within a class period. 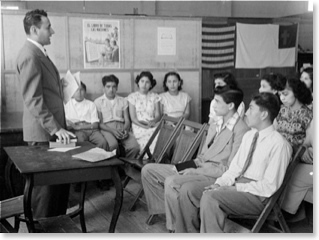 Mexican American students and Sunday school teacher, 1949. Russell Lee Center for American History, UT-Austin.